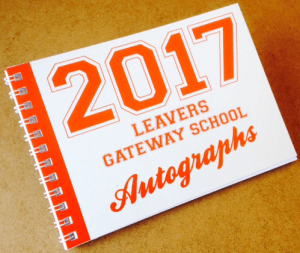 Our autograph books are a fabulous, fun and low cost gift for school leavers. Each book is front personalised using any of our designs below (tailored to your school to whatever degree you like) and contains 40 sheets of blank paper for children to have their friends, teachers and other staff sign their books. The autograph books then become a great keepsake of their time at school. Our autographs books are printed and finished in-house which guarantee thier quality. The covers are printed on a 250gsm board, coupled with 40 (80 sides) blank sheets of paper (90gsm blank paper) and finished at the back with the card cover. The books are wire bound. The books are A6 size, so they measure 148mm wide by 105mm high (one quarter of the piece of A4 paper). This makes them the perfect size for both school bags and children’s pockets! All prices quoted above include VAT (20%) and setup. Delivery will be charged as an additional £8+VAT(20%) for delivery to any mainland UK address. Delivery will be by our courier, DPD and a signature will be required upon receipt. Your autograph books will be delivered in under two weeks from the date of order.